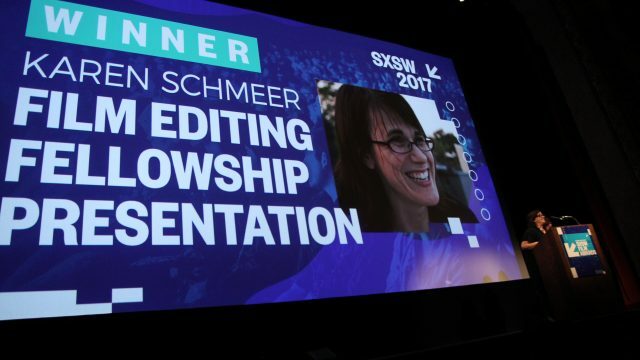 Applications for The Karen Schmeer Film Editing Fellowship are open and will run from August 2, 2017 through September 29, 2017. Awarded once a year, the fellowship honors the memory of gifted editor Karen Schmeer (The Fog of War; Fast, Cheap & Out of Control; Bobby Fischer Against the World), who was killed in a hit-and-run at the age 39. Applicants must have edited at least one feature documentary (60 minutes or longer), but no more than three, and plan on living in the US between March 2018 and March 2019. The winner will take part in a special presentation during the 2018 SXSW Film Awards on Tuesday, March 13 at the Paramount Theatre. The fellowship includes a SXSW Film Badge. Learn about 2017 fellow Leigh Johnson, find out more about benefits, and click here to apply to the Karen Schmeer Editing Fellowship.